Acne is the worst. Just about everyone has experienced it and NOBODY wants to have to deal with it. If you have tried just about every product out there you may want to try spirulina for acne. Thats right! Spirulina. Its about as natural as you can get for clearing up your skin. And there is a good chance that you will see a difference (lets hope). If you have had acne for a while and have done your homework on prevention, chances are you have come across the benefits of supplementing zinc. Well spirulina happens to be a natural source of zinc and will give you about .2mg for every 10 grams you take (source – USDA). Thats not a ton of zinc, and you should eat more sources throughout your day, but remember, thats only 1 tablespoon. Zinc is very important for a number of reasons, but as to why it benefits your skin, it is still unclear. It is thought however, that the reason it is so beneficial is because it plays a rule in carrying vitamin A to your skin cells. And vitamin a is very beneficial, from reducing skin oils, preventing clogged pores, etc. If you become deficient in zinc you may notice effects surprisingly fast. One research study reported that after only 12 days of a zinc-free diet, decreases in skin health were noticeable. While another reported that zinc supplementation brought a number of unhealthy skin related symptoms (facial rash, foot fungus) back to health. Subjects had developed bad skin health when zinc was taken out of their diet and when zinc was added back into their diet the symptoms cleared up. You have probably heard of different B vitamins and how they can help clear up your skin. Spirulina happens to contain 9 of the 12 B vitamins! Including B1, B2, B3, B5, B6, B7, B8, B9, and B12. Thats a lot, and they all have their good skin health properties. B5 (Pantothenic Acid) – is active in hormone production (testosterone) and helps reduce skin aging, sun spots, redness, etc. The B vitamins do a lot more than what I briefly mentioned, but for the sake of space and time I kept it short. As you can see just about all of them can improve skin health in one way or another. Spirulina also has Vitamin E, and a lot of it. Spirulina has more vitamin E per weight than pure wheat germ, which is known for having a lot. Vitamin E is very effective in promoting younger healthier skin. It is an antioxidant and fights off free radicals in the body. These free radicals damage cells and cause early signs of aging. It is commonly used for reducing wrinkles, spots, etc. Besides the vitamins and zinc, spirulina has carotenoids, some of which have some benefits to skin health. Carotenoids are not vitamins, but they provide the appropriate precursers so that your body can synthesize its own vitamins. Remember how vitamin A is effective at reducing skin oil, clogged pores, etc?, much of which is causes acne. Well spirulina has the carotenoids cryptoxanthine and beta-carotene. With these to carotenoids your body can make its own vitamins A. The downside to this is that your body has to convert these to the form of vitamin A, retinol in the small intestine. And the conversion percentage is usually pretty low. Is Spirulina Worth Trying For Acne? I do believe it is worth giving a try if you have not already. But its not guaranteed to work. There are many different causes of acne, excess skin oil, inflammation, too much bacteria, clogged pores, and the list goes on. 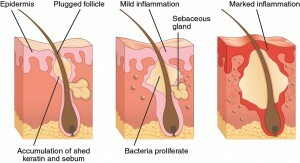 One cause can trigger other causes and it always ends with inflamed red pimples. Without knowing the cause you do not know how to stop it. So you have to experiment with different products/foods until you find what works for you. I personally have seen a difference in my skin since I started taking spirulina and I have an article about it right Here. So if you have acne and can’t seem to find a solution, give spirulina a try. If it doesn’t clear up your acne at least you will be benefiting in all sorts of other health related ways. If you want to buy spirulina then take a look at some quality products that I have reviewed. Not all spirulina is good quality. Many factors come into play when spirulina is both, grown and packaged, that affect its nutrient value.The products that I have reviewed below are of the highest quality.